In a small saucepan, combine juice, sugar and ginger. Bring to a boil, stirring occasionally. Remove from heat and let cool completely. Strain and discard ginger. To make drink: Fill a highball glass with ice. Add 1 shot of cran-ginger syrup, one shot of rum and top with hard cider. Stir to combine. 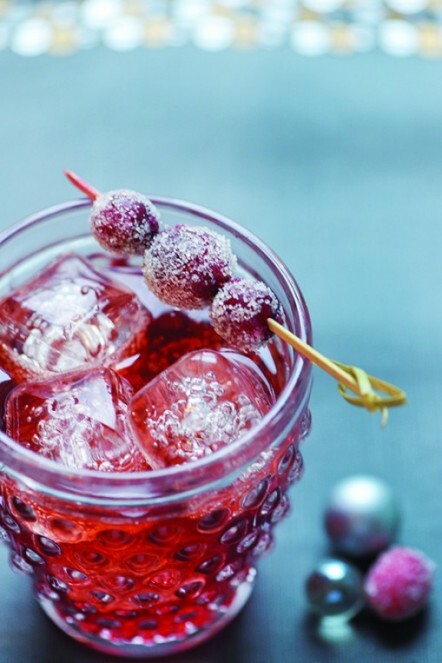 Garnish with sugared cranberries if desired. *Note; Make sure to buy pure unsweetened cranberry juice (like R.W. Knudson), most 100% cranberry juice with no sugar added have grape or apple juice (natural sweeteners).